The player Blues acquired in trade with Sabres off to career start in hopes of helping a franchise win on a regular basis, on pace for 119 points. 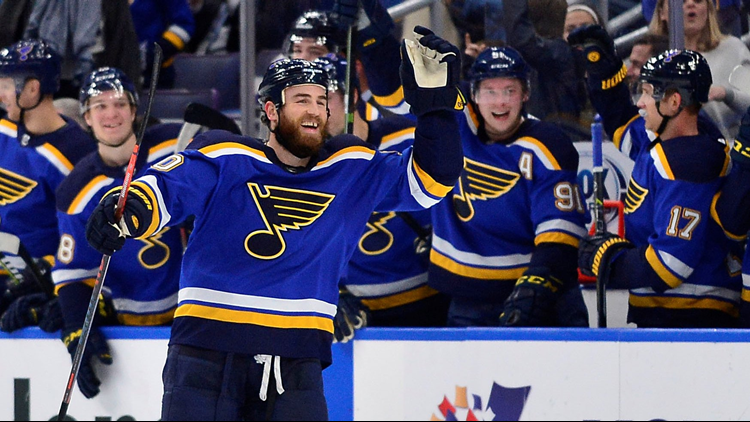 ST. LOUIS -- When the Blues made the blockbuster trade on July 1, acquiring center Ryan O'Reilly from the Buffalo Sabres, it was with the intent and purpose of bringing on a difference maker. O'Reilly had spent the previous three seasons with a Sabres team that was at or near the bottom of the NHL standings and drowning away in anguish and lacking any sort of winning atmosphere and culture. So when the Blues pulled the trigger on O'Reilly and his $7.5 million cap hit for the next five years, sending Patrik Berglund, Vladimir Sobotka, Tage Thompson, a 2019 conditional first-round pick that's top-10 protected and a 2021 second-round pick, it was their all-in icing on the cake move for the day, one in which they felt they knew what they were getting: a point producer, a faceoff specialist, a defensively responsible center, but most importantly, a hard worker. O'Reilly, 27, who tied a personal NHL best eight-game point streak (seven goals, eight assists) -- accomplished three other times -- with his first NHL hat trick in a 4-1 win over Carolina on Tuesday, has displayed all the tendencies the Blues hoped for and expected, but the work ethic part? He's absolutely blown the organization away with it. "Wow! I see now why he was paid so high, honestly," former Blues defenseman Jamie Rivers said in September when Rivers was running the Blues' informal skates. "Everybody has question marks around guys' salaries. I think that was one of the biggest discussions when the trade was being made in and around there was, 'Wow, he makes a lot of money.' I'm seeing now why he does. His skill level is through the roof, his work level is through the roof. You can see that he pushes himself to the brink every day, and in doing so, it's pushing other guys to that spot, so the combination of his skill level and his work ethic, and obviously his locker room presence, is going to be huge for the Blues." Case in point: on practice days, one of the first skaters on the ice -- and early -- is O'Reilly. When practice begins, no matter if it's hard in nature or light, O'Reilly is leading by example with his work rate, and even after a practice, when most have left the ice or even the building, who's one of the, if not the last people off the ice working on the small nuances of making his game better and staying on top of his craft? Ryan O'Reilly. The work and attitude have rubbed off on his teammates and coaches in such a positive way that others are attracted by the work. "He's always been like that," said Blues goalie Chad Johnson, O'Reilly's teammate with the Sabres two of the past three seasons. "He's hard on himself, he demands a lot of himself. That work ethic is contagious. Guys stay out and work with him after, the skill stuff. That's just how he is as a player and a person. He works hard. That's why he is where he is because of his work ethic." After a recent Blues practice, it was O'Reilly and his linemates, David Perron and Zach Sanford, that was on the ice for 30-45 minutes after practice had concluded. The unit had played six straight games together and was producing at a high clip. "He's one of the hardest working guys on our team, if not in the league, and I think that's a big part of his success and that's a big thing I've seen taking out of what he does," Sanford said. "All the little stick skills might take some time to get to his level, he's pretty good there, but the hard work and the positioning and being in the right spot at the right time, that's been working for him and that's what I'm trying to get working for me. "He's always one of the first guys on the ice, always one of the last guys off the ice. He's always running these extra skill drills and I think it's been good for our team as a whole. Before, there were only a couple guys on the ice. Now there are six or seven guys doing his drills and working on those little skills. It's not just good for me personally, but it's been good for our whole team." And when a player of O'Reilly's magnitude choose to remain to get the extra work in, coaches have no choice but to oblige and teach. "We're all observers right," Blues coach Mike Yeo said. "So when you see a guy go out there early, you see him staying on late after practice, putting the work on, and not just being out there, but doing things with purpose. Actually trying to improve your game or probably, more importantly, prepare so you take a specific shot over and over, now you get that opportunity in the game, you're ready for that opportunity. It's a fine line between getting the puck and having it come off your pick so when that opportunity comes you want to be ready for it. I think smart people observe that they recognize that it's working for him, then I think people are certainly following along." Lofty expectations were placed on O'Reilly in Buffalo when he was acquired from the Colorado Avalanche in 2015 before signing a lucrative seven-year, $52.5 million contract on July 3, 2015, with $45.5 million of that money in the form of signing bonuses. But once O'Reilly turned the chapter to the Blues in expectations of joining an organization focused on winning, he wanted to set the best example possible, one in which his teammates would gravitate towards. "Yeah, I think that’s something I’ve always tried to do," O'Reilly said. "We’ve had such good guys that it’s easy to work with. We get out there, we get creative with it and we do purposeful work and for myself it builds confidence. I think it does in other guys, too." O'Reilly leads the Blues in points (19), goals (seven) and assists (12) through 13 games. His 19 points were tied for seventh in the NHL entering Wednesday's games. His career-high in points (64) and goals (28) were set with the Avalanche in the 2013-14 season and assists (39) were set with the Sabres in 2015-16. At this ridiculous pace O'Reilly is on, he would obliterate all three. At the current 82-game pace should O'Reilly play every game, he would finish with 119 points (44 goals, 75 assists). Not to mention his NHL-leading 63.2 percent faceoff winning percentage (103 of 177). He's also got a shooting percentage of 17.9 percent, which is 7.1 percent higher than his career average. "This is what we were hoping for from him," Yeo said. "For me, that was just a reward of consistently good play is what he's giving us, and when he's on top of his game, he's engaged in battles, he's winning faceoffs, he's a strong two-way center, he's impacting the game defensively in our zone and all over the ice and obviously he's impacting the game offensively. I think we've seen his value, what he's brought to the power play. We've seen his power, what he brought to us in depth of offense. I feel that's been consistent all year long. He's been giving those things. When you play consistent hockey, when you do the right thing, some nights the puck is going to bounce your way and some nights you might get three. Some nights you might not get anything. But you're playing a real strong game and you keep doing that over time you'll get rewarded. "When a guy is on top of his game like that, then guys want to play with him. Obviously, it helps their game, helps them get to their game, and I think 'Schwartzy' [Jaden Schwartz] and Vladi [Vladimir Tarasenko], both guys playing with him, it's a good opportunity for them." No matter what happens from here on out, O'Reilly has made it known he wants to impact the Blues in the proper way, and the end result is winning hockey games. And by doing so, he'll keep the practice habits the same even if points don't come but the wins do. "I think that’s a staple that I’ve always done," O'Reilly said. "I want to always continue to grow my game. I always want to be a student of the game and find ways and challenge myself and get better. It’s nice here, you see the number of guys that work after practice on different things. We’re all moving in the right direction."